Kraemer constructed power pole foundations in the backwaters of the Mississippi River near Winona, Minnesota. Project access was mainly by rail with limited truck access. Work was performed from barges with site assistance provided by a crane located next to the existing railroad track. Foundation work included driving nine battered pipe pile to resistance. The piling were cut off to grade and a prefabricated cofferdam/form system was lowered around the piles. 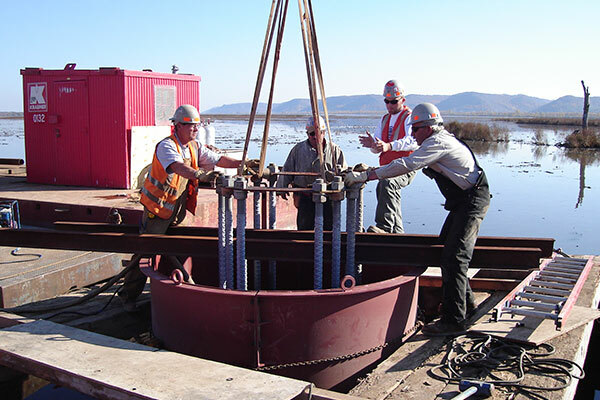 A seal pour was placed and the cofferdam form was dewatered allowing for placement of the reinforced tower footing. Large anchor bolts assemblies were placed and aligned prior to the pour as these would serve as the anchors for the new steel power poles. In addition, Kraemer assisted in tower erection and transmission line transfer.